LARGE SIZE—73-(L) Ã 23-(W) Ã 82-(H). Max Weight Capacity- 300lb. bed size- 59 inches long x 23 inches wide. 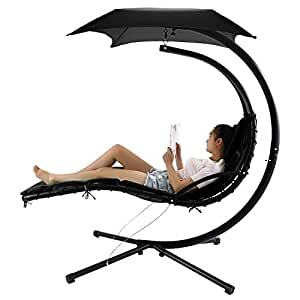 HIGH QUALITY AND GOOD DESIGN—Modern heavy duty powder coated make the tube surface become smooth and rust-resistant, durable for long time;curved ergonomic shape fits your body comfortably for the ultimate in relaxation. FEATURES—Removable padded cushion with built-in pillow provide you soft and comfortable experience,built-in umbrella provide you different sunbathing as you like;Padded cushion filled with high-density foam for a more comfortable lounging experience;Legs are capped with rubber feet to make them more durable and to help protect floors. US STOCK—We ship it from US, and you will receive it in 3-7 days after we ship it. Ideal for your relaxing or sleeping in your garden and have fun with your family. Modern design with heavy duty powder coated metal frame can support up to 250kg.